Heist Society: A First Clues Mystery Series for Kids. About the series: When Katarina Bishop was three, her parents took her on a trip to the Louvre … to case it. For her seventh birthday, Katarina and her Uncle Eddie traveled to Austria … to steal the crown jewels. 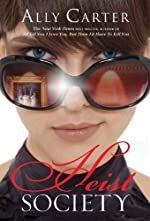 When Kat turned fifteen, she planned a con of her own—scamming her way into the best boarding school in the country, determined to leave the family business behind. Unfortunately, leaving "the life" for a normal life proves harder than she'd expected.